The grave of a man or woman next to a hut, being of the type known as dolmen with a flat horizontal stone supported below on a number of upright stones. This type of grave was constructed for the eldest of siblings. Such megalithic grave markers were peculiar to the Moro Meza, and was not generally found among other so-called Moro groups neighbouring. Manual catalogue entry (thermofax catalogue copy in folder '27-06 Seligman Slide Collection') - "V.h.26. 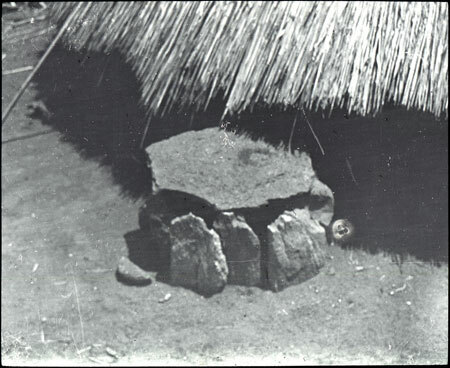 Megalithic grave - Moro (S.Sudan)" additional ms note (1967) - "slightly scratched"
Note on lantern slide ms ink - "V.h.26. Megalithic grave - Moro (S.Sudan). CGS." Morton, Chris. "Moro Meza grave" Southern Sudan Project (in development). 03 Jan. 2006. Pitt Rivers Museum. <http://southernsudan.prm.ox.ac.uk/details/1967.26.289/>.